In this special event, Op-Docs series producer and curator Jason Spingarn-Koff presents a selection of recent works and a conversation with contributing filmmakers, including SXSW directors Penny Lane and Brian Frye. 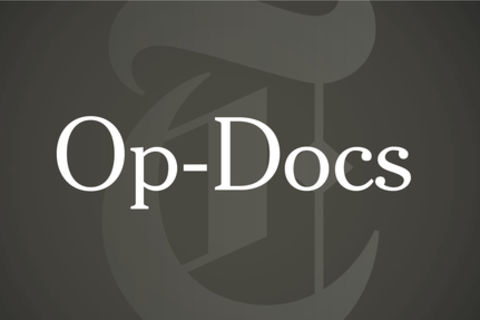 Launched in 2011, The New York Times’s Op-Docs series invites both renowned and emerging filmmakers to contribute new short opinion documentaries reflecting a wide range of styles and subject matter, including current affairs, contemporary life and historical subjects. Past contributors include Errol Morris, Laura Poitras, Jessica Yu, Alex Gibney, The Gregory Brothers and Casey Neistat. Jason Spingarn-Koff joined the staff of The New York Times in 2011 as the first video journalist for Opinion. He is the series producer and curator of Op-Docs (nytimes.com/opdocs), a new initiative at The Times for short opinionated documentaries by independent filmmakers and artists. He directed the feature documentary “Life 2.0”, which screened at the 2010 Sundance Film Festival and SXSW and was acquired by OWN: Oprah Winfrey Network’s Documentary Club. Prior films and journalism have appeared on PBS, BBC, MSNBC, Time.com and Wired News. He was a 2010-2011 MIT Knight Science Journalism Fellow and is a graduate of Brown University and the UC Berkeley Graduate School of Journalism. Director and Co-Producer Penny Lane has been making award-winning documentaries and essay films since 2002. Her films have screened at Rotterdam, AFI FEST, The Media That Matters Film Festival, Rooftop Films, Big Sky Documentary Film Festival, MoMA's Documentary Fortnight and many other venues. She has been awarded grants from Cinereach, TFI Documentary Fund, LEF Foundation, NYSCA, Experimental Television Center, IFP and the Puffin Foundation. OUR NIXON is her first feature documentary, for which she was awarded several grants and a residency at Yaddo. She is a Creative Capital grantee and was named one of Filmmaker Magazine's "25 New Faces of Independent Film" in 2012. Katerina Cizek is an Emmy-award winning documentary director. Her work has documented the Digital Revolution, and has itself become part of the movement. She works across many media platforms: digital media, broadcasting (radio and television), print and live presentations/installations. She is the director of an award-winning evolving digital media project at the National Film Board of Canada, called HIGHRISE . She realized the acclaimed NFB Filmmaker-in-Residence program, winner of a Webby Award, a Banff Rocky Award, a Canadian New Media Award, among others. Her media projects have instigated criminal investigations, changed UN policies, and have screened as evidence at an International Criminal Tribunal. Cizek's films include the Hampton-Prize winner Seeing is Believing: Handicams, Human Rights and the News (co-directed with Peter Wintonick), and The Dead are Alive: Eyewitness in Rwanda, the first global television documentary (1995) made about the genocide. Cizek is one of Realscreen's Trailblazers for 2011 (January 2012). She has travelled the world with her projects, presenting her innovative approaches to the documentary genre and digital media. Touted by the CBC as “a young filmmaker to watch”, Simon Ennis came into his own in Drumheller, Alberta (the dinosaur capital of Canada). As an infant he was once held by legendary German actor Klaus Kinski - an event which most likely led to his lifelong love of the extreme. Simonʼs first feature, the dark comedy YOU MIGHT AS WELL LIVE, premiered at the 2009 Slamdance Film Festival where it won the DOS EQUIS MOST INTERESTING FILM AWARD. The Toronto Star said of YMAWL that “no recent Canadian film so richly deserves a dedicated cult of admirers”, Variety called it “a promising first feature” and Ainʼt It Cool News praised it for “making me gut laugh, which most comedies canʼt”. LUNARCY! is currently making its festival run and will have its US premiere at SXSW this March before premiering on EPIX Television in the States and Superchannel in Canada later in the Spring. Simon lives in Toronto with his two cats and is a die hard Blue Jays fan. BRIAN L. FRYE is a filmmaker, writer and law professor. His experimental films have appeared in The Whitney Biennial, New York Film Festival's "Views from the Avant-Garde", New York Underground Film Festival, The Warhol Museum, Pleasure Dome and Images Festival. Brian was named (along with Penny!) one of Filmmaker Magazine's "25 New Faces of Independent Film" in 2012. His short films are in the permanent collection of the Whitney Museum and distributed by the Filmmaker's Coop. His writing on film and art has appeared in October, The New Republic, Film Comment, Cineaste and the Village Voice. His legal scholarship concerns interactions between the law and the arts, nonprofit organizations and intellectual property. He is currently a Professor of Law at the University of Kentucky.